One of the many things you will want to know before relocating to Spring Texas is how the cost of living compares to the city you are moving from. CNN money has recently developed a cost of living calculator to help you with just this task. Since the cost of living calculator does not have Spring Texas as an option you will have to choose Houston Texas. But since Spring is often considered a suburb of Houston you should still be able to come up with a fairly accruate comparison. Since I am currently working with buyers relocating from Anchorage Alaska, Baltimore Maryland, and Cleveland Ohio, I thought it would be interesting to find out which of these buyers is going to receive the largest financial benefit by relocating to Spring Texas. The lucky buyer relocating from Baltimore Maryland will enjoy the largest decrease in his cost of living. His housing costs are going to be 53% less, groceries will be 19% less, and his utilities will be 17% less in Spring Texas than in Baltimore. 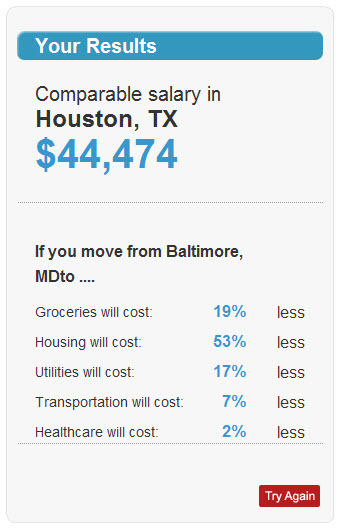 A salary of $60,000 in Baltimore is equivalent to $44,474 in Spring Texas. I have always thought the cost of living was extremely affordable in Spring Texas and with this cost of living calculator I can now prove it. What are the average temperatures for Spring Texas?